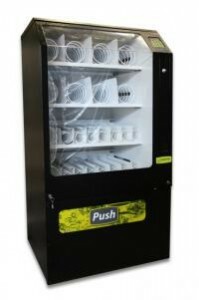 The Snack Mate Combo is a 3 tray snack and 4 selection can, change giving vendor for medium to large size locations. Installation – Easily installed by one person. Cold drink expansion cassette – increase your cold drink capacity by almost 50% in Summer by simply replacing the 3rd snack tray with a cold drink expansion cassette! Front ventilation allows machine to be placed hard against a wall without restricting ventilation to the refrigeration system. Refrigeration module is easily accessible by removing front panel.